Portfolio de Wink Strategies: Daniele Henkel Inc.
Les Entreprises Daniele Henkel, founded by the famous businesswoman and media personality of the same name, are a symbol of a Quebec success story. Beyond the sphere of wellness and beauty, brand communication activities must reflect not only the quality of the products and services, but also the strong values embodied by Daniele Henkel and the company she created. With different activities aimed at different audiences, the main challenge of the redesign of this group of web sites was to effectively guide the user in a way to intuitively find the required information. This sprawling web site includes an e-commerce component for individuals, which has been specially designed for users to discover the new product line and maximize conversions. 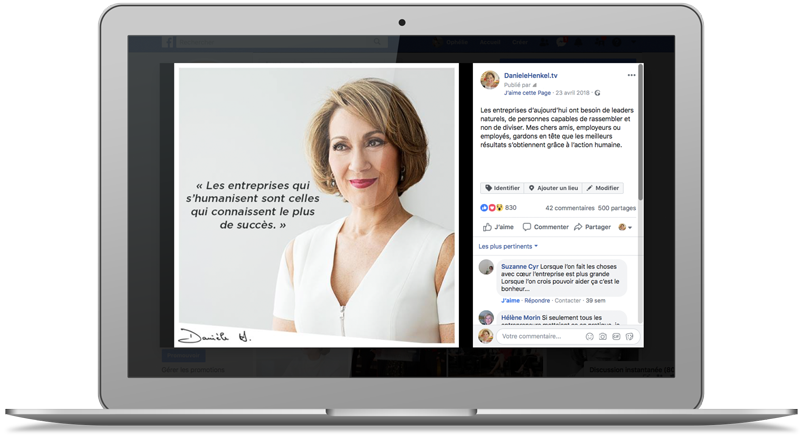 Daniele Henkel’s corporate and personal Facebook pages regroups large communities, composed of wellness fans, beauty professionals and individuals inspired by the success of the group. Besides the daily social media page management required to grow the community and its engagement, occasional sponsorship campaigns have been set up for special occasions or to showcase some of the group’s products or services. As a media personality known for her social commitments and inspiring journey, Mrs. Henkel is sought for various interventions, mentoring and events. Being accompanied strategically and operationally in her public relations allows Mrs. Henkel to focus on her core activity – doing business – and allows her activities and events to be in line with her values, commitments and availabilities.